Who would have thought they’d need instruction on how to wash their hair at this point in life? I sure didn’t! But the tips herein are based on years and years of asking curly hairstylists tons of questions and reading up on curly hair, and I’m including my exact hair-washing method step-by-step. 1. Step under the shower stream and put your head back; do not touch your hair yet, just let it get nice and wet. Touching ruffles the cuticle, and you want to do this with curly hair as little as possible (the book describes it as velcro ― when you ruffle the cuticle the little shingle-like fibers that coat your hair shaft stand up and stick to each other or repel each other, causing a not-so-pretty halo effect). The top of your hair is called the canopy, and it needs to be left as un-interrupted as possible. Because of this, I almost never touch the top of my hair, except when applying conditioner and gel very carefully. 2. Start lifting your hair from underneath, making sure all of it is getting wet. When this is done, grab some conditioner. Put a good cherry-size dollop (give or take) on your fingers and start massaging your scalp. I usually need to use three of these dollops to get through my whole scalp, I do front, middle, then back. Massage until you feel like you’ve done a thorough job of removing build-up. You’ll know when you’ve done this long enough. 3. 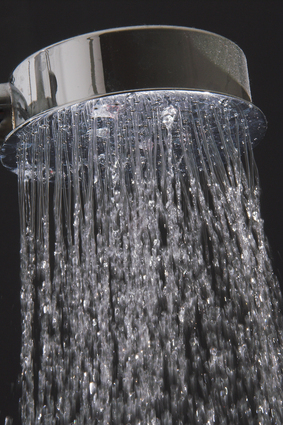 Completely wash this out by scrubbing your scalp with your fingertips under the shower stream. You are still going underneath the hair to access your scalp, never ruffle the top of it. Basically, you are reaching up under your hair from the sides to get to the scalp, not coming straight through the top. Try to touch your actual hair as little as possible while doing this. During this step, I use my cheaper conditioner, because as you can imagine it can get quite costly to use this much conditioner 2+ times a week. 5. After washing out 2/3 of the conditioner (literally takes seconds) flip upside down again. Now you squeeze your hair going downward, like this, to remove excess water. 6. Next we apply the gel using the same method. Take about a grape- to cherry-sized amount and rake it through your hair going carefully downward. Then wring it out using the downward squeeze, as demonstrated above. 8. Grab a few micro-fiber towels if you don’t have one already. The book recommends an old t-shirt or micro-fiber towel, because you don’t want to use the thicker-pile body and face towels on your delicate hair. Remember, we are still trying to disturb the shaft as little as possible, and the softest material is the best way to do this. Again, you will use the towel to squeeze your hair out going downward. Your head can be right-side-up for this. NEVER RUFFLE. And never scrunch, unless you want to make your hair curlier. In that case, scrunch away. This may feel weird to you, as we all seem to naturally want to ruffle our hair with a towel to dry it, but this is the worst thing for your hair shaft. 9. Drying is a chapter all its own, so I will cover that in my next post. Hi, How goes it?? I just found your site yesterday and have to say I found it interesting. Thanks for all the good info. After clicking though a bit and reading your technique (of which I thought I’d heard most of ) I thought to myself, now that makes sense! So I tried this for the first time in the shower last night. Along with not washing my hair, I’m trying to get used to the feel of scrubbing my scalp from “underneath” but I see the logic so I’m going to practice as I’m trying lessen my frizz and maximize my curls. My main question for you at this point is how often do you actually wash your hair? Hi Christine! I’m glad to hear you’re finding the site useful. Most of the information has definitely been written about and said before (the basis for my blog is Lorraine Massey’s “Curly Girl”) but I’ve added additional anecdotes from my personal experience with these methods. I wash my hair with a cleanser about every 2 weeks. I switch it up between the Low-Poo, No-Poo, and the Lemon Juice/Conditioner mixture mentioned on this blog. The rest of the time I simply scrub my scalp with conditioner each time I get it wet in the shower, and re-coat it with conditioner. I find it’s time to wet it in the shower when it’s starting to get extra unruly, a little itchy, or dry. Usually every 3 days. Deep conditioners are also important, and should be used about every other week; and more often in dry, cold weather. This includes oil treatments that can be left on your hair overnight or during the day. More info is on the pages of my site, so dig around and good luck!